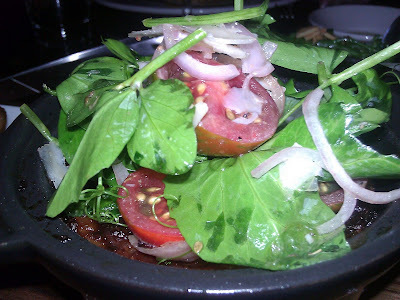 Melbourne Lifestyle Blog: Barca Food and Wine (High Street, Armadale). Barca Food and Wine (High Street, Armadale). We were a group of four girls in a place where ladies socialise – there were only two men in the whole restaurant! I’m not sure which card drew the females. It was a relaxing spot. I felt like I was in someone’s loungeroom more than in a restaurant. It was the perfect place to gossip and unwind. With lots of seeminingly delicious options, and eager conversation after not seeing each other for a long time, the waitress came to our table three times before we were finally ready to order. Finally I chose the vegetarian lasange (the only vegetarian main but there were several small dishes) and the broccolini with almonds and lemon to share. One in our group commented on the bread, saying that can tell a good restaurant by its bread, and that “I think the food is going to be good”. The dishes looked small but somehow, despite my usually substantial appetite, I was bursting at the seams after my meal. The lasange was filled with mushrooms, artichokes and chestnut bechamel. It was garnished by a tomato and watercress salad. I was most interested to try the bechamel, but the flavour was so subtle that I struggled to pick it. The mushrooms on the otherhand had an intense (but enjoyable) flavour of vinegar. Whilst the meal looked beautiful presented in its mini ramekin, it was harder to eat and see the contents (although no doubt it was kept warm because of this). To accompany were eggplant chips which the waitress described as “the best”. 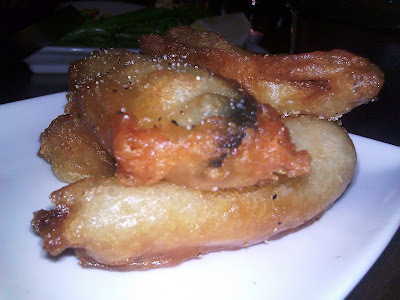 They were done in a tempura batter; hot and crispy. Of course, I enjoyed them, although they could have been made even better with a creamy, tangy sauce (maybe aioli). The broccolini was very simple with a piece each for four. Alongside my meal I had a glass of the Basa Verdejo. It was different to what I would usually drink; fresh and acidic with a bitter taste on the end. It went well with my meal. Barca was my choice. I had tried it years ago but was nervous to test it with a new group on the special occasion of our friend moving back to Melbourne. So what was the verdict? They liked it. The food was delicious. The decor modern and simple. And of course, the company energising after too much time apart.